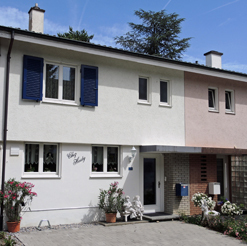 Our bed & breakfast guest house is situated in Reinach (Switzerland, Baselland), in the close agglomeration of Basel (10km distance to Basel). Basel is situated in the charming Dreiländereck, the triangle of the three countries Switzerland, Germany and France. 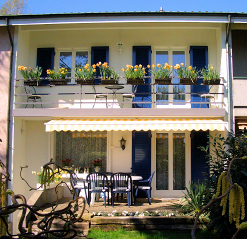 Thanks to very good public transportation, you could easily pursue from Reinach your business activities during the different exhibitions in Basle or to enjoy the manifold tourist attractions of the “Dreiländereck” (brochures available). We offer a comfortable accommodation inclusive breakfast at good prices. To have a detailed overview of our services click on “guest service”, for a description of our room go to page “rooms & prices”. For reservation and further information you can contact us at any time by telephone or email.